Donald N. Martin & Company, Inc. 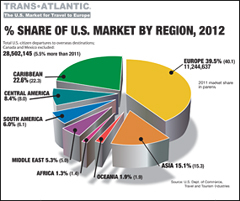 The Trans-Atlantic report on the U.S. Market for Travel to Europe was launched in 2001, soon after the 9/11 attacks. The original purpose was to, first, measure the fall-off in traffic, and then the long recovery. The twice-monthly report is built around a Trans-Atlantic Traffic Trends chart of leading airline traffic and capacity, and pulls together tourism data from many sources. 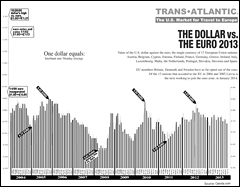 Trans-Atlantic also keeps track of basic U.S. economic trends, dollar-euro rates and marketing developments, and makes regular projections of U.S. traffic to Europe. Trans-Atlantic is now offered on a subscription basis: $150 for 24 issues over 12 months. 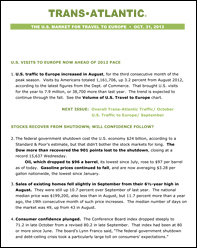 To subscribe, send an email to TransAtlantic@dnmartinco.com with your name, company name and email address. We'll send an invoice.